An interview with Silvia Saunders in the New York Times (1974). (1) Silvia Saunders (1901-1994) is the daughter of A.P. Saunders, well-known peony hybridizer, who took over her father’s nursery to distribute his new peony hybrids. She was also the founder of the ‘Paeonia’ newsletter that brought together peony hybridizers. What better time to think about peonies than now when the magnificent plants are in top form. These stately perennials were the center of attention recently at the Greenwich Garden Center, Cos Cob, Conn., when Miss Sylvia Saunders visited to talk about her favorite flower. The center’s fine collection was just coming into peak bloom for the occasion. 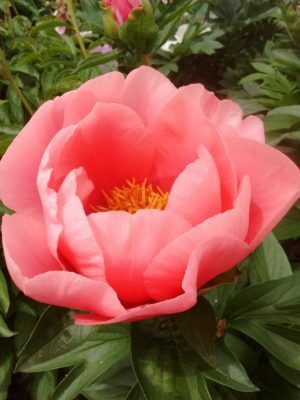 Her late father, Prof. A. P. Saunders, was well‐known for his peony hybrids, which developed from a backyard hobby to a nursery business. He was also a chemistry professor at Hamilton College. Twenty‐four years ago, Miss Saunders gave up her New York career as a magazine photographer and returned to Clinton, N. Y., to help out with her parents’ small business “for a year.” She never left. This is not to say that there are no admirable peonies to grow now. There are scores of magnificent varieties available and the background of some of the famous Saunders Hybrids is fascinating history. The Chinese “discovered” the peony growing wild among the thicket plants in Manchuria and Mongolia, Miss Saunders explained. This was the species Paeonia albiflora (now sometimes listed as lactiflora). The Chinese domesticated the species, raised it from seed, and through continual selection, developed strains with pure white to deep maroon flowers and variations in between. The Chinese began to export these in the 1700’s to the acclaim of gardeners throughout the world. 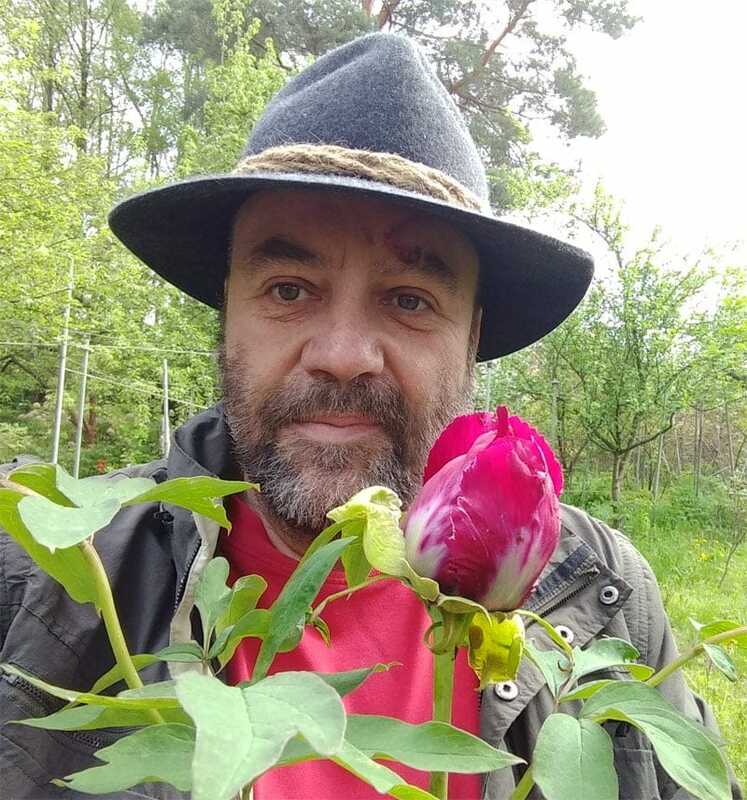 Three Caucasian species also came into focus and peony growers, including Prof. Saunders, explored their possibilities. These are P. tenuifolia, the dwarf, fernleaved peony, a fine rock garden specimen; P. macrophylla, the big‐leaf, which is good for breeding work, and P. mlokosewitschii, with jadegreen aristocratic foliage. The latter species was crossed with other Caucasian species and this hybrid was then crossed with a fourth species, P. lobata with mittenshaped leaves, to provide the beautiful pink colors for which the Saunders Hybrids are famous. So much for the herbaceous peonies which die down to the ground each fall. For many, the most elegant are the tree peonies. Sometimes the flowers are extremely large, to 10 inches or more, and the petals are fragile looking suggesting crepe de Chine. Colors range from white to yellow to pink and the deepest reds. The foliage is particularly attractive. Although the tree peony (P. suffruticosa) is a native of northwestern China, it was the Japanese who perfected its beauty. They began exporting some of their magnificent varieties in the late 1890’s. Hybridists turned to the species, P. lutea, to add yellow to the tree peony. “It actually is a delightful species,” Sylvia Saunders noted. “but it has the dreadful habit of drooping the flower heads.” This species is much used by hybridists to advance strains of tree peony. 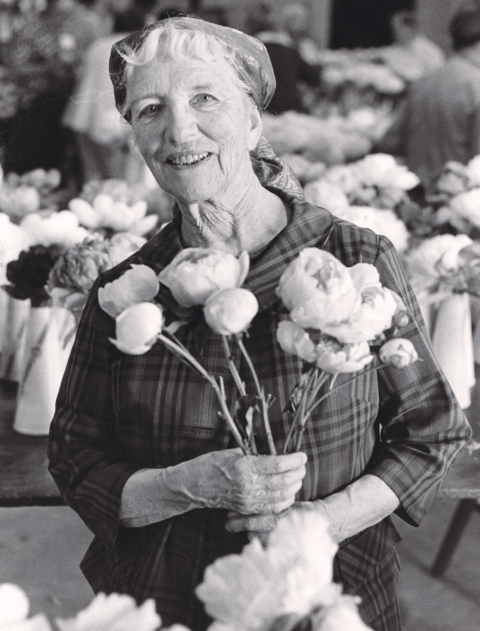 Looking to the future, Sylvia Saunders took note of the recent breakthroughs in peony development when the supposedly impossible was accomplished. A tree peony and herbaceous peony were crossed. This original cross is attributed to the Japanese hybridist Toichi Ito. Several named hybrids followed including Yellow Heaven, Yellow Emperor and Yellow Crown, which currently are exorbitantly expensive. But they may be the new road for future developments genetically, according to Miss Saunders, but they may not be good garden plants. To grow peonies, two essentials are: excellent soil drainage and sunshine. The plants are set out in the fall in deeply prepared soil which has been enriched with wellrotted compost or manures plus bonemeal or other highphosphorus fertilizers. Though Miss Saunders is retiring, the famous Saunders Hybrids will continue. Her nursery has been sold to Dr. David Reath, a veterinarian, in Vulcan, Mich., located on the Upper Peninsula. Several other nurseries also specialize in peonies: Louis Smirnow, Brookville, L. I. 11545, and Gratwick Tree Peonies, Pavilion, N. Y. 14525.